As a Valentinian Christian I have no doubt whatsoever that Saint Paul, the great doctor of the church was himself a Gnostic and I don't like any criticisms against him. I also don't agree with the conclusion of the video which says Christianity and Saint Paul was influenced by other pagan mysteries like Isis and Serapis. No, Saint Paul truly received the highest pleromic revelation from the pneumatic Christ who resides in the Pleroma. I literally believe in the Valentinian myth of Sophia and it is not just a myth but it is more real than ordinary reality. Pauline Christianity was indigenous and was not influenced by any other pagan mystery religions. I also believe that the Pastoral Epistles like Timothy 1 and Timothy 2 were fake letters in the name of Saint Paul and should be immediately dropped from the Biblical Canon. I for one just skim away any verses cited from the Pastoral Epistles because they were not divinely inspired and they were not written by Saint Paul. Paganism and orthodox Christianity are entirely incompatible. The God of the Old Testament is a jealous god and wants all heathens to be destroyed since they honour and worship other gods rather than him. Many fundamental Christians if given a chance will stone heathens to death because it is said in their bible that anyone who serve other gods than Jehovah who brought Jews out of the land of Egypt must be stoned to death (Deuteronomy) and killed. Pagan doctrines are a big heresy to the church. As you can see Paganism agrees next to nothing with orthodox Christianity. If this is the case people might be wondering how one can call himself a Pagan Christian. The missing link between Paganism and Christianity is Gnosticism. A Pagan and a Christian holding a truth in agreement. St Paul, the apostle to the Gentiles who worked so hard to bring even Gentiles into the ministry of Jesus Christ. You are neither Jew nor a Greek but one in Christ. Jesus belongs to the Pagans too. Its not my intention to offend any orthodox Christians but this is what I truly believe and this is the truth. Jesus was sent by the Demiurge, The God of Old Testament, Jehovah and Christ who went inside Jesus's body at the time of his Baptism in the form of a dove was sent by the all loving Holy Father from whom all things have come and for whom we live. I swear to God in the name of King Helios that as long as my breathe exists I will work to restore Paganism as a major world religion and will combat all the conspiracy and the suppression that is being done against it. "The Suryaites or Sauras are followers of a Hindu denomination that started in Vedic tradition, and worship Surya as the main visible form of the Saguna Brahman. The Saura religion was influential in times of old but declined between the 12th and 13th century CE and today remains as a very small movement." "The Saura sect that worships Surya as the supreme person of godhead and saguna brahman doesn't accept the Trimurti as they believe Surya is God. Earlier forms of the Trimurti sometimes included Surya instead of Brahma, or as a fourth above the Trimurti, of whom the other three are manifestations; Surya is Brahma in the morning, Vishnu in the afternoon and Shiva in the evening. Surya was also a member of the original Vedic Trimurti, which included Agni and Vayu. Some Sauras worship either Vishnu or Shiva as manifestations of Surya, others worship the Trimurti as a manifestation of Surya, and others exclusively worship Surya alone." Sir Roger Penrose and his ideas has left a huge influence on my life right from my teenage. I knew that one of the greatest problems facing biology was What is consciousness? and all the leading biologists of that time had sidelined this issue by postulating their own theories as to how consciousness arises in the human brain without giving a scientific definition for consciousness. And as I was researching I found the man whom I was looking for its none other than Sir Roger Penrose and he was saying something very interesting things about consciousness. Consciousness involves Non-computable ingredients - Roger Penrose. 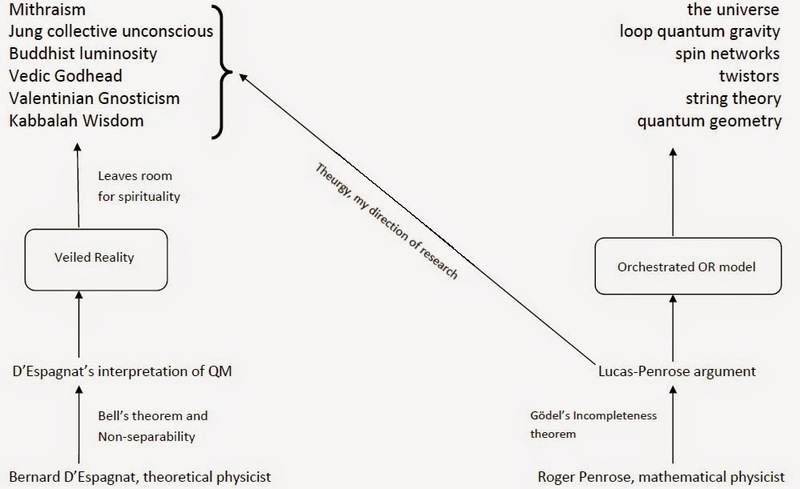 Penrose put forward a more robust proof against strong AI first argued by J.R Lucas in his 1959 paper Mind, Machines and Gödel and hence Penrose argument is known generally as the Lucas-Penrose argument about Gödel's theorem. This is one of most straight forward proof that strong AI is impossible which was put forward by Sir Roger Penrose. Here is a summary of the new argument (this summary closely follows that given in Chalmers (1995: 3.2), as this is the clearest and most succinct formulation of the argument I know of): (1) suppose that “my reasoning powers are captured by some formal system F,” and, given this assumption, “consider the class of statements I can know to be true.” (2) Since I know that I am sound, F is sound, and so is F’, which is simply F plus the assumption (made in (1)) that I am F (incidentally, a sound formal system is one in which only valid arguments can be proven). But then (3) “I know that G(F’) is true, where this is the Gödel sentence of the system F’” (ibid). However, (4) Gödel’s first incompleteness theorem shows that F’ could not see that the Gödel sentence is true. Further, we can infer that (5) I am F’ (since F’ is merely F plus the assumption made in (1) that I am F), and we can also infer that I can see the truth of the Gödel sentence (and therefore given that we are F’, F’ can see the truth of the Gödel sentence). That is, (6) we have reached a contradiction (F’ can both see the truth of the Gödel sentence and cannot see the truth of the Gödel sentence). Therefore, (7) our initial assumption must be false, that is, F, or any formal system whatsoever, cannot capture my reasoning powers. There are arguments and counter-arguments to this proof and some strongly criticized his works to which Penrose has humbly replied to all their criticisms. I knew that the scientific community is not going to take him seriously and that due to their own biased and intellectually dishonest attitude they will never test his hypothesis leaving no confirmation bias whatsoever. Penrose strongly urged to the scientific community that the phenomena of consciousness requires new non-computable physics which is so far unknown to us. He argued that the missing science of consciousness can be explained only by discovering that non-computable physics inherent in nature. Apart from showing interest in science I equally had the same interest and curiosity in religion too and unlike most anti-religious people who simply discarded all religions as pure imaginations of a feeble mind I took the pain-staking approach of reading their scriptures and understanding the worldview of all religions and why do they believe and act like the way they do. One thing what I found out was that the main motivations for religious belief was not poverty or lower IQ or superstition but the main motivations of the more seriously religious people was there religious experiences of the divine. Ancient mystery schools was never like the modern established religions of the world and they truly possessed secret knowledge of the Platonic realm and the dogma of oriental philosophy is that Mind and Body are two different things. I speculated that what if this was the missing science of non-computable physics which Penrose is arguing so rigorously for decades and he is still arguing for it as these news articles show. Roger Penrose says physics is wrong from string theory to Quantum mechanics. Therefore I decided to test Penrose ideas once and for all and went on to practice theurgy after being seriously influenced by Roger Penrose and got confirmation of oriental philosophy and that the ancients were absolutely right about the existence of the Platonic realm. 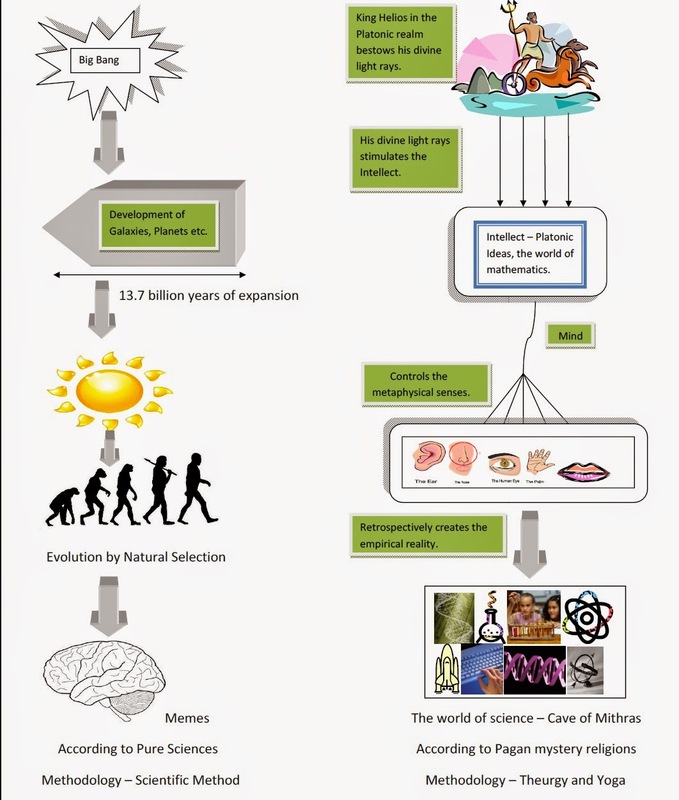 This is the direction of my research which scientists do not know. How does this new Non-computable physics changes our view of the world? Well I'm afraid it changes our worldview in a drastic way and affirms the statement made by Bernard D'Espagnat that 'What we call reality is only a state of mind'. If [quantum theory] is correct, it signifies the end of physics as a science. Albert Einstein. Dualistic theories of mind and body should be considered seriously and the model on the right is the new scientific model of the world. Its the end of Physics and the start of a new era of Theurgy - The science of the Gods. First the • (Point), the Monad, Bythus (the Deep), the unknown and unknowable Father. Then the Δ (Triangle), Bythus and the first emanated pair or Duad, Nous (Mind) and its syzygy Aletheia (Truth). Then the □ (Square), the dual Duad, Tetractys or Quaternary, two males ||, the Logos (Word) and Anthrôpos (Man), two females, their syzygies, = Zoê (Life) and Ekklesia (the Church or Assembly), Seven in all. The Triangle the Potentiality of Spirit, the Square the Potentiality of Matter; the Vertical Straight Line the Potency of Spirit, and the Horizontal the Potency of Matter. Next comes the Pentagram ⋆, the Pentad, the mysterious symbol of the Manasáputras or Sons of Wisdom, which together with their syzygies make 10, or the Decad; and last of all, the Hexalpha or interlaced Triangles ✡ the Hexad, which with their syzygies make 12, or the Dodecad. Such are the Contents of the Pleroma or Completion, the Ideas in the Divine Mind, 28 in all, for Bythus or the Father is not reckoned, as it is the Root of all. The two small circles within the Pleroma are the syzygy Christos-Pneuma (Christ and the Holy Spirit); these are after-emanations, and, as such, from one aspect, typify the descent of Spirit to inform and evolve Matter, which essentially proceeds from the same source . . . The Circle of the Pleroma is bounded by a circumference emanated from Bythus (the Point), this is called the Horus (Boundary), Staurus (Stock, Stake, or Cross) and Metæcheus (Participator); it shuts off the Pleroma (or Completion) from the Hystêrema (the Inferiority or Incompletion), the larger from the smaller Circle, the Unmanifested from the Manifested. Within the Circle of the Hysterêma is the Square of primordial Matter, or Chaos, emanated by Sophia, called the Ektrôma (or Abortion). Above this is a Triangle, primordial Spirit, called the Common Fruit of the Pleroma, or Jesus, for to all below the Pleroma it appears as a unity. Notice how the Triangle and Square of the Hysterêma are a reflection of the Triangle and Square of the Pleroma. Finally, the plane of the paper, enclosing and penetrating all, is Sigê (Silence). This symbolism truly represents the doctrine of Valentinians and the Vedic Aryans that this world was created by the demiurge which is modelled based on the real Pleromic world. The symbol is allegorical and should not treated as a literal representation of the Pleroma. This symbol unites the Valentinian tradition with the Shukla Yajurveda tradition and I have this symbol on my car's rear window which truly represents our gnostic doctrine unifying both the traditions who want to send out the same message to the world. 24 The wisdom of the scribe depends on the opportunity of leisure; and he who has little business may become wise. 25 How can he become wise who handles the plow, and who glories in the shaft of a goad, who drives oxen and is occupied with their work, and whose talk is about bulls? 26 He sets his heart on plowing furrows, and he is careful about fodder for the heifers. 27 So too is every craftsman and master workman who labors by night as well as by day; those who cut the signets of seals, each is diligent in making a great variety; he sets his heart on painting a lifelike image, and he is careful to finish his work. 28 So too is the smith sitting by the anvil, intent upon his handiwork in iron; the breath of the fire melts his flesh, and he wastes away in the heat of the furnace; he inclines his ear to the sound of the hammer, and his eyes are on the pattern of the object. He sets his heart on finishing his handiwork, and he is careful to complete its decoration. 29 So too is the potter sitting at his work and turning the wheel with his feet; he is always deeply concerned over his work, and all his output is by number. 30 He moulds the clay with his arm and makes it pliable with his feet; he sets his heart to finish the glazing, and he is careful to clean the furnace. 31 All these rely upon their hands, and each is skilful in his own work. 32 Without them a city cannot be established, and men can neither sojourn nor live there. 33 Yet they are not sought out for the council of the people, nor do they attain eminence in the public assembly. They do not sit in the judge's seat, nor do they understand the sentence of judgment; they cannot expound discipline or judgment, and they are not found using proverbs. 34 But they keep stable the fabric of the world, and their prayer is in the practice of their trade. 1 On the other hand he who devotes himself to the study of the law of the Most High will seek out the wisdom of all the ancients, and will be concerned with prophecies; 2 he will preserve the discourse of notable men and penetrate the subtleties of parables; 3 he will seek out the hidden meanings of proverbs and be at home with the obscurities of parables. 4 He will serve among great men and appear before rulers; he will travel through the lands of foreign nations, for he tests the good and the evil among men. 5 He will set his heart to rise early to seek the Lord who made him, and will make supplication before the Most High; he will open his mouth in prayer and make supplication for his sins. 6 If the great Lord is willing, he will be filled with the spirit of understanding; he will pour forth words of wisdom and give thanks to the Lord in prayer. 7 He will direct his counsel and knowledge aright, and meditate on his secrets. 8 He will reveal instruction in his teaching, and will glory in the law of the Lord's covenant. 9 Many will praise his understanding, and it will never be blotted out; his memory will not disappear, and his name will live through all generations. 10 Nations will declare his wisdom, and the congregation will proclaim his praise; 11 if he lives long, he will leave a name greater than a thousand, and if he goes to rest, it is enough for him. 12 I have yet more to say, which I have thought upon, and I am filled, like the moon at the full. 13 Listen to me, O you holy sons, and bud like a rose growing by a stream of water; 14 send forth fragrance like frankincense, and put forth blossoms like a lily. Scatter the fragrance, and sing a hymn of praise; bless the Lord for all his works; 15 ascribe majesty to his name and give thanks to him with praise, with songs on your lips, and with lyres; and this you shall say in thanksgiving: 16 "All things are the works of the Lord, for they are very good, and whatever he commands will be done in his time." 17 No one can say, "What is this?" "Why is that?" for in God's time all things will be sought after. At his word the waters stood in a heap, and the reservoirs of water at the word of his mouth. 18 At his command whatever pleases him is done, and none can limit his saving power. 19 The works of all flesh are before him, and nothing can be hid from his eyes. 20 From everlasting to everlasting he beholds them, and nothing is marvelous to him. 21 No one can say, "What is this?" "Why is that?" for everything has been created for its use. 22 His blessing covers the dry land like a river, and drenches it like a flood. 23 The nations will incur his wrath, just as he turns fresh water into salt. 24 To the holy his ways are straight, just as they are obstacles to the wicked. 25 From the beginning good things were created for good people, just as evil things for sinners. 26 Basic to all the needs of man's life are water and fire and iron and salt and wheat flour and milk and honey, the blood of the grape, and oil and clothing. 27 All these are for good to the godly, just as they turn into evils for sinners. 28 There are winds that have been created for vengeance, and in their anger they scourge heavily; in the time of consummation they will pour out their strength and calm the anger of their Maker. 29 Fire and hail and famine and pestilence, all these have been created for vengeance; 30 the teeth of wild beasts, and scorpions and vipers, and the sword that punishes the ungodly with destruction; 31 they will rejoice in his commands, and be made ready on earth for their service, and when their times come they will not transgress his word. 32 Therefore from the beginning I have been convinced, and have thought this out and left it in writing: 33 The works of the Lord are all good, and he will supply every need in its hour. 34 And no one can say, "This is worse than that," for all things will prove good in their season. 35 So now sing praise with all your heart and voice, and bless the name of the Lord. Dr. Rama Swamy has done extensive research for well over four decades on the subject of reincarnation and rebirth along with Ian Stevenson and others and his research and case studies proves that the transmigration of souls is an empirical fact and can be proved by hypnosis and other scientific methodologies. He has answered all your doubts on the subject of reincarnation and rebirth in his series of e-books available in Kannada and English which he is giving it for free for the welfare and betterment of humanity. He calls for world peace by stating what's the point in fighting for religion, nationality, race, gender, colour, oil and other material goals when in reality you are not this body but a pure soul with no afflictions to any material attributes. The world will be a reasonable place if more and more people lose their individuality, their name, creed, gender, race, nationality and religion and identify themselves with the eternal soul and conduct themselves accordingly without showing any pride because all human beings are ONE and this world is an illusion. He also argues that all mental diseases are not actually diseases at all instead repercussions from our past life experiences. His research are well reviewed and well cited with a loads of articles and evidence done by other psychologists around the globe and the author takes you to a fascinating set of case studies from near death experiences to the wide field of hypnotism and psychology. As a Valentinian Christian I love the Pauline epistles more than anything else in this world and I love Saint Paul. As a gentile I will defend him no matter what. I completely agree with everything in this video except the final conclusion in it. According to us Saint Paul truly received the highest pleromic revelation from the pneumatic Christ and was not motivated by other pagan mysteries like Isis and Serapis. For us he was not a false apostle of the church instead he was the great Apostle to the apostles, the great doctor of the church. Valentinian Christianity is the orthodox Christianity and all the other Catholic Christians, Protestant Christians, Mormonism and the countless different Christianities are plain wrong. I urge everyone to drop the Pastoral epistles from the Biblical canon. Christianity will live forever and spread worldwide and will be more appealing to the modern scientific world if all Christians see their religion as a mystery religion of Valentinian Christians. Pleroma literally exists and forms the body of Christ and the goal of ancient gnosticism was to return to it and lose your self identity to it. The arrogant fools of the academic world and many ignorant believers and followers of eastern religions and western esotericism do not know that the gods of the pagans do exist literally and that one has to take their existence very seriously in order to completely understand their philosophical structure. I have been stating for a long time that there is an astonishing degree of similarities between Neoplatonism, Neoplatonic Christianity, Tibetan Buddhism and the historical Vedic religion and in relation to that these three terminologies Deity Yoga in the Vedic religion, Yidam worship in Tibetan Buddhism and Theurgy in Neoplatonism takes my argument to a much more solid level. Yoga itself is a religion, its neither a set of philosophies or a set of stretchy exercises instead it is a set of rituals to achieve union with the pagan deities. At each and every step of sun salutations we utter magical spells to pagan gods silently in the mind. This generates a great efficacy in the transformation of our subtle bodies, nadis, pranic flow currents and chakras and pleases the pagan deities existing inside our subtle bodies who aid us in our spiritual enlightenment and in this way we attain the knowledge and wisdom of all the secret mysteries of the cosmos and gain mastery over nature and not become its slaves. Most secular Buddhists like Stephen Batchelor and Sam Harris and followers of Theravada Buddhism are not aware of the fact there are deities in Buddhism which exist literally and are not just symbolic or mere creations of the human mind. The modern world blurred by the scientific attitude looks so stupid in front of these traditions which possess ageless wisdom and truths about cosmos. Yidam (Tib. ཡི་དམ་, Wyl. yi dam; Skt. iṣṭadevatā) — one of the three roots, the tutelary or chosen meditation deity, which is the root of spiritual accomplishment. Yidams are often classified according to whether they appear in peaceful and wrathful form. "In Tibetan Buddhism practitioners will have a yidam, that is, a practice of a particular buddha or deity with which they have a strong karmic connection, which for them is an embodiment of the truth, and which they invoke as the heart of their practice. Since in their practice they have recognized the yidam as the natural radiance of the enlightened mind, they are able to view the appearances with this recognition, and let them arise as the deity." What is the importance of Yidam practice? When we consider all the great masters of the Indian and Tibetan traditions, we find that in every case, their accomplishment came about through their practice of a yidam. They chose a deity and guarded that practice like their very life force, and on the basis of that complete commitment to the path of deity yoga, they practised the stage of generation, the stage of completion, and integrated these arriving at their final realisation of complete accomplishment and enlightenment. In fact, if we look at the great masters of the Indian and Tibetan traditions of Vajrayana practice, we find there is no-one who did not meditate upon a yidam deity. In the Nyingmapa school, all the great vidyadharas have had a main yidam deity which they practised. If their practice was of a peaceful deity, it was almost always Vajrasattva. If it was a wrathful deity, it was almost always Vajrakilaya. Guru Rinpoche and Vimalamitra themselves attested to the fact that Vajrakilaya was their yidam deity. What he said was true. Perhaps the reason is that so many of us in the Nyingma tradition place great emphasis on the Dzogchen tradition and its effortlessness. Often we make the mistake of just paying lip service to effortlessness, while really just being kind of lazy. Look at someone like Kyabje Dilgo Khyentse Rinpoche. No-one would question that his realisation was higher than anyone’s, and yet day and night he would recite prayers and mantras and do his practice. And he was inseparable from Vimalamitra! Look at the kind of effort that he put into his practice. Then there are others who just don’t do very much of that at all. They just sit there with their mouths open. I couldn't agree more with what Orgyen Tobgyal Rinpoche has said here. He is absolutely right when he said that the great accomplishments of Indian and Tibetan masters came only from the worship of a pagan deity. A typical example is Ramakrishna Paramahamsa who was the teacher of Swami Vivekananda and all his accomplishments came only after he obtained the grace of goddess mother Kali. All the modern practitioners blinded by the stupid scientific attitude ignore the pagan gods and blindly go after knowing Brhaman and Nirvana and as you can see despite all their efforts for over a century or so they fail to produce a single mastery over nature or also called as siddhis. Why? its mainly because they follow the path of emptiness and they do not worship the pagan gods because for many westerners it is an embarrassment to worship pagan deities because it would undermine their stupid spiritual but not religious life. No wonder why many of the extraordinary supernatural powers that can be performed by following eastern mystical practices are rarely demonstrated nowadays. Aadhidaivik dukkh-haan: freedom from pain etc. caused by fate or due to reliance on fate. In Yidam practice one surrenders his individuality and attains oneness with the deity as explained below in Advice on Yidam practice. I am Samantabhadra, the mighty Vajradhāra. Translated by Adam Pearcey, Rigpa Translations, 2013. Theurgy (/ˈθiːɜrdʒi/; from Greek θεουργία) describes the practice of rituals, sometimes seen as magical in nature, performed with the intention of invoking the action or evoking the presence of one or more gods, especially with the goal of uniting with the divine, achieving henosis, and perfecting oneself. The great divine Iamblichus, Proclus and Julian the Emperor gave a great deal of emphasis to theurgy in Neoplatonism which the academic scholars still see it with contempt eyes without understanding the supra-rational character of the art of theurgy. Proclus (c. 480): theurgy is "a power higher than all human wisdom embracing the blessings of divination, the purifying powers of initiation and in a word all the operations of divine possession"
Julian the Emperor said in his Hymn to King Helios that no one knows about the subject more better than the Neo-platonic philosopher the divine Iamblichus. The Emperor Julian the Apostate (332-363), embraced Neoplatonic philosophy and worked to replace Christianity with a version of Neoplatonic paganism. Because of his death and the hold mainstream Christianity had over the empire at the time, this was ultimately unsuccessful, but he did produce several works of philosophy and theology, including a popular hymn to the sun. In his theology, Helios, the sun, was the ideal example of the perfection of the gods and light, a symbol of divine emanation. He also held the mother goddess Cybele in high esteem. Julian favored ritual theurgy, with an emphasis on sacrifice and prayer. He was heavily influenced by the ideas of Iamblichus. 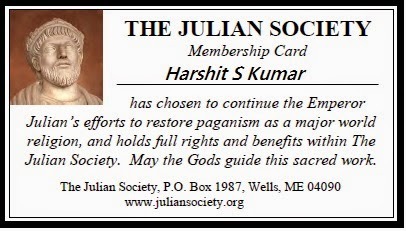 I want to fulfil the dream of Julian, his great desire to revive the pagan mystery religions back to the roman empire which for unfortunate reasons failed to succeed after his reign. "By magical incantation rapid rivers may be made to run back to their fountains, the sea be congealed, winds become destitute of spirit, the sun be held back in his course, the moon be forced to scatter her foam, the stars be torn from their orbits, the day be taken away, and the night be detained." - Iamblichus on the mysteries of Egyptians, Chaldeans and Assyrians. Offering to the Gods: A Neo-platonic perspective by Edward P Butler is a fine study on the subject and demonstrates the wisdom and knowledge that the great divine Iamblichus had on the subject. As the reader can see these set of pagan ideas are at the core of pagan philosophy and their attitude towards nature and religion. All the pagan religions have a certain affinity towards the art of theurgy and in eastern religions it was called by different names that's all but the theory and the practice remains absolutely identical. I urge scholars, practitioners and believers around the world to not to distort eastern mysticism and western esotericism and undermine the existence of pagan gods and their culture and philosophy. Do not love the world nor the things in the world. Gnostics are often described as world haters or escapists. In some way such a description is quite right because it is absolutely foolish to talk about the wisdom of the wise to people of this age when the God of this age, The Demiurge has destroyed all the Wisdom of The Wise and has led people unto falsehood and untruth. Only the Father is real and this world which is created by the Demiurge is not real and actually this world is just a mere shadow copy of the things that exists in the Pleroma, the realm of the Father. We should not love anything of this world because if we love then the love of the Father is not in us and it is not at all difficult to hate this world and love the Father because he is such an amazing wonderful being that you will fall in love with him as soon as you see his radiance and you will start hating the things in this world seeing how deficient they are compared to the world of the Father. Many Christians who live in pagan dominated countries like India face the dilemma of whether to participate in the festivals of heathens or not and whether to eat the food sacrificed to pagan gods or not. We were celebrating a heathen festival in our office and doing idol worship. I specifically looked around to check whether my Christian colleague was participating with us in the ritual and found myself that he was indeed present along with us participating with our ritual, worshipped the idol and ate the food sacrificed to the pagan god. On the way back to upstairs I was waiting for him and asked him politely by placing my arm around his shoulders, "Can you worship a pagan god?" and he said confusingly by nodding his head, "No, this is the first time I am worshipping one" and he looked pretty tensed and upset about it. I went and searched what the Bible had to say about this and found that Saint Paul in his letter to Corinthians has specifically discussed about this topic. 8 Now about food sacrificed to idols: We know that “We all possess knowledge.” But knowledge puffs up while love builds up. Those who think they know something do not yet know as they ought to know. But whoever loves God is known by God. Be careful, however, that the exercise of your rights does not become a stumbling block to the weak. For if someone with a weak conscience sees you, with all your knowledge, eating in an idol’s temple, won’t that person be emboldened to eat what is sacrificed to idols? So this weak brother or sister, for whom Christ died, is destroyed by your knowledge.When you sin against them in this way and wound their weak conscience, you sin against Christ. Therefore, if what I eat causes my brother or sister to fall into sin, I will never eat meat again, so that I will not cause them to fall. I am not a big fan of idol worship and our Vedic rishis didn't do idol worship. Idolatry was introduced by the later Hindus which comes under the Agama shastras. The great doctor of the church Saint Paul was right when he said, "flee from idolatry" and in 1 Corinthians chapter 8 he discusses about this topic in detail. I am a Valentinian Christian and we interpret the Pauline letters esoterically than how most orthodox Christians generally would interpret it. The teachings in the unforged Pauline letters can be differentiated to have been given to two classes of Christians mainly psychic Christians and pneumatic Christians. When the great Saint Paul says ".....yet for us there is but one God, the Father, from whom all things came and for whom we live; and there is but one Lord, Jesus Christ, through whom all things came and through whom we live." he is making a soteriological differentiation between the psychic Christians who rely on blind faith and the pneumatic Christians who rely on the gnosis of the Father. We maintain that there is one psychic Christ who is the son of the Demiurge in the kenomic world and there is an another pneumatic Christ who is the son of the unknown Father in the pleromic world. The psychic Christ is the one whom the psychic Christians rely upon for their salvation which is based on blind faith and they feared and understood the Lord Jesus Christ in this way and finally they too will be redeemed at the end of the world and enter the Pleroma. On the other end the pneumatic Christ is the one whom the pneumatic Christians rely upon who are redeemed here and now through the grace of gnosis of the unknowable Father. When one interprets Saint Paul's teachings in this way the Pauline letters makes perfect sense. God, the Father and his son the pneumatic Christ represent the pneumatic Christians and Demiurge and his son the Lord, Jesus Christ represent the psychic Christians. All the genuine Pauline letters has to be interpreted in this way. Then the apostle Saint Paul goes on to say, "But not everyone possesses this knowledge." which clearly shows that there was secret knowledge or gnosis known only to an initiated few Christians despite orthodox Christians denying that such knowledge existed. I advised my colleague to read 1 Corinthians Chapter 8 and 10 which says, "Some people are still so accustomed to idols that when they eat sacrificial food they think of it as having been sacrificed to a god, and since their conscience is weak, it is defiled. But food does not bring us near to God; we are no worse if we do not eat, and no better if we do." and Saint Paul clears all the doubts and confusion among fellow Christians here. Amen! Earlier I made a post titled "The philosophical differences between Advaita, Buddhism and Samkhya" where I said that it was Shankara who took us out from the repeated onslaught of Buddhist philosophy and re-established the doctrine of Advaita all over India but if anyone had noticed carefully I said that even Shankara was too influenced by Buddhist philosophy and introduced his theory of Mayavada or illusionism into the Vedas and the Upanishads which is in complete variance with Indian philosophy which always considered the creator and the world to be real. This post is just about that which refutes Shankara's theory of Mayavada or his theory of superimposition, a refutation which results in a wide range of implications for Indian philosophy which would place it along side Neo-platonism and Neo-platonic Christianity on a much firmer ground by embracing the philosophical position of Platonic realism. This is the reason why I'm a strong platonic realist and not an idealist or a scientific realist. Its also the same reason why I have not given up my works and has taken up celibacy or sannyasa ashrama. 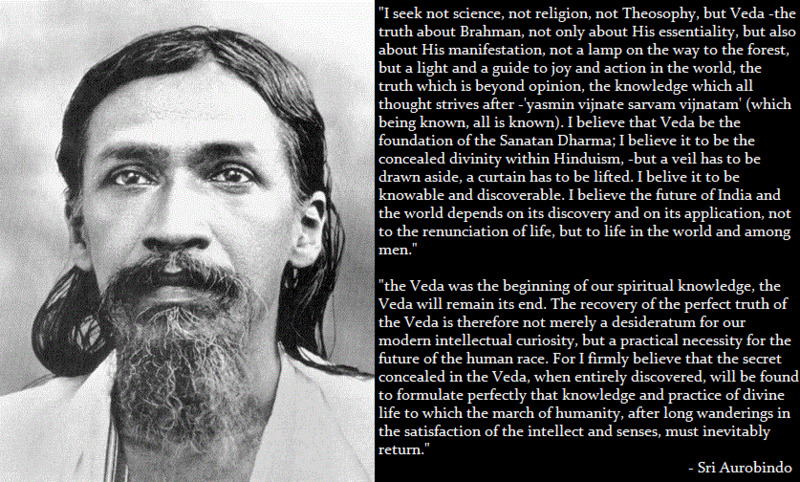 Sri Aurobindo, the great mystic was the first to raise his strong voice against Shankara's theory of Mayavada and criticized him relentlessly through his voluminous works on the Vedas and especially on one important Upanishad of all which is the Isha Upanishad which forms the very soul of my research and my life. Sri Aurobindo takes an all out attack on Shankara's theory of Mayavada using Isha Upanishad as his main scriptural source and I love every point he makes in his criticism. The main obstacle that stands in the way of accepting the straightforward meaning of the Isha Upanishad and rightly understanding its inner truth about the Brahman, the Self and the Divine, is Mayavada, Illusionism, preached by Shankaracharya and the commentary he wrote on this Upanishad. The one-pointed drive towards withdrawal that is Illusionism and the much-praised inaction of the Sannyasi are completely at variance with the Isha Upanishad. If the meaning of the slokas is strained and tortured to give an opposite sense, the solution of this quarrel becomes impossible. The Upanishad in which it is written: “Doing verily works in this world one should wish to live a hundred years”, and again: “Action cleaves not to a man” — the Upanishad which proclaims with courage: “Into a blind darkness they enter who follow after the Ignorance, they as if into a greater darkness who devote themselves to the Knowledge alone”; and again says: “By the Birth one enjoys Immortality”, how can that Upanishad be reconciled with Mayavada, Illusionism and the path of withdrawal? A highly erudite person, who was possibly the chief sponsor of Monism in South India after Shankara, expunged it from the list of the twelve Upanishads and installed the Nrisimhatapini in its place. Shankaracharya was not so daring as to alter the prevailing canon. The Upanishad was a “Sruti” (heard scripture), and Illusionism was a subject for inquiry in the “Sruti” and as such, he assumed, the meaning of the “Sruti” could not but be favourable to real Illusionism. Even though I am from South India I completely agree with Sri Aurobindo here because one has to speak the truth and criticize the mistakes made by anyone even though he or she is an highly famous and a reputable person. No hard feelings here and we agree with everything Shankara says except his theory of Mayavada or his insistence that only Brahman is real and the world and God are unreal. This doctrine of Mayavada put forward by Shankara around 6th century has destroyed the all important Indian philosophy of Purva Mimamsa (deals with Vedic rituals) which is as important as Uttara Mimamsa (Vedanta - enquiry about Brahman) because one cannot exist without the other and this lack of knowledge of Purva Mimamsa and the Vedas is the main reason for all the confusion which exists in understanding the relationship between Ishavara, Prakrithi, Purusha and Jiva in Advaita which many followers face. The truth has been buried under the carpet for well over 5000 years which is a very long time and this change of perspective has global ramifications because it shows that we have to seriously consider the Vedas and the Vedic deities in it to fully understand the true integral Advaita of the Vedic rishis as they viewed it who gave equal importance to both a personal God with innumerable qualities and an impersonal God without qualities. For many whose main mode of acquiring knowledge is through Logic and reason this is highly unacceptable as both of these concepts are contradictory notions and forces one to make the wrong conclusion that either one view has to be false and the other view has to be wrong but as Aurobindo says the great seer rishi Yajnavalkya at each step tramples at the Law of Contradiction and in each sloka announces its invalidity; he finds in the secret heart of the opposites the place for the reconciliation and harmony of their contradiction. God is beyond logic and reason and yet many meta-physicians try to understand metaphysical concepts like God through logic and reason despite the fact that Kant destroyed the synthetic priori knowledge of metaphysics centuries ago and William of Ockham who postulated the occam's razor was himself a theist and he seems to have said that "only faith gives us access to theological truths. The ways of God are not open to reason, for God has freely chosen to create a world and establish a way of salvation within it apart from any necessary laws that human logic or rationality can uncover." Very few people are aware of the traditional interpretation as to how the Isha Upanishad came into existence in this world. It was actually revealed by the Sun God who is the master of the Vedas and the supreme God of the universe. According to traditional accounts, Yājñavalkya was the son of Devarāta and was the pupil of sage Vaisampayana . Once, Vaisampayana got angry with Yājñavalkya as the latter argued too much to separate some latter additions to Yajurveda in being abler than other students. The angry teacher asked his pupil Yājñavalkya to give back all the knowledge of Yajurveda that he had taught him. The Sun God, pleased with Yājñavalkya penance, assumed the form of a horse and graced the sage with such fresh portions of the Yajurveda as were not known to any other. This portion of the Yajurveda goes by the name of Śukla Yajurveda or White-Yajurveda on account of it being revealed by Sun. It is also known as Vajasaneya Yajurveda, because it was evolved in great rapidity by Sun who was in the form of a horse through his manes.The rhythm of recital of these vedas is therefore to the rhythm of the horse canter and distinguishes itself from the other forms of veda recitals. In Sanskrit, term "Vaji" means horse. Yājñavalkya divided this Vajasaneya Yajurveda again into fifteen branches, each branch comprising hundreds of Yajus Mantras. Sages like Kanva, Madhyandina and others learnt those and Śukla Yajurveda branched into popular recensions named after them. Every one cites the Isha Upanishad and interprets the text as though he is an all knowing god without showing any sensitivity, humility and thought to understand how the Shukla Yajurveda tradition interprets this particular Upanishad from the traditional point of view. The Isha Upanishad introduces to us the integral spiritual realisation and the principle of the integral yoga; within a short space it resolves many difficult problems. It is a śruti replete with sublime, profound and fathomless significances. This Upanishad, concluded in eighteen slokas, explains in these small mantras many major truths of the world. Such “infinite riches in a little room” can be found only in this śruti. Synthesis of knowledge, synthesis of dharma, reconciliation and harmony of the opposites form the very soul of this Upanishad. In Western philosophy there is a law called the law of contradiction, according to which opposites mutually exclude each other. Two opposite propositions cannot hold good at the same time, they cannot integrate; two opposite qualities cannot be simultaneously true at the same place and in the same instrument. According to this law, opposites cannot be reconciled or harmonised. If the Divine is one, then however omnipotent He might be, He cannot be many. The infinite cannot be finite. It is impossible for the formless to assume form; if it assumes form, then it abrogates its formlessness. The formula that the Brahman is at the same time with and without attributes, which is exactly what the Upanishad also says about God who is nirguṇo guṇī, with and without attributes, is not admitted by this logic. If formlessness, oneness, infinity of the Brahman are true, then attributes, forms, multiplicity and finiteness of the Brahman are false; brahma satyam jaganmithyā, “the Brahman is the sole reality, the world is an illusion” — such a totally ruinous deduction is the final outcome of that philosophic dictum. The Seer-Rishi of the Upanishad at each step tramples on that law and in each sloka announces its invalidity; he finds in the secret heart of the opposites the place for the reconciliation and harmony of their contradiction. The oneness of the universe in motion and the immobile Purusha, enjoyment of all by renunciation of all, eternal liberation by full action, perpetual stability of the Brahman in movement, unbound and inconceivable motion in the eternal immobility, the oneness of the Brahman without attributes and the Lord of the universe with attributes, the inadequacy of Knowledge alone or of Ignorance alone for attaining Immortality, Immortality obtained by simultaneous worship of Knowledge and Ignorance, the supreme liberation and realisation gained not by the constant cycle of birth, not by the dissolution of birth but by simultaneous accomplishment of Birth and Non-Birth, — these are the sublime principles loudly proclaimed by the Upanishad. Unfortunately there has been a great deal of unnecessary confusion regarding the meaning of this Upanishad. Shankara is generally recognised as the most important commentator of the Isha Upanishad, but if all these conclusions are accepted, then Mayavada, the Illusionism of Shankara, sinks in the bottomless ocean. The founder of Mayavada is incomparable and immensely powerful among the philosophers. Just as thirsty Balaram brought to his feet the Yamuna unwilling to alter her course, by dragging and pulling her with a plough, so also Shankara, finding this Upanishad destroyer of Mayavada and standing across the path toward his destination, dragged and pulled the meaning till it agreed with his own opinion. One or two examples will suffice to show the miserable condition to which this Upanishad has been reduced by such treatment. For a more deeper understanding of the differences between our integral Advaita and Shankara's Advaita please read Integral Advaitism by Sri Auorbindo by Ramachandra Mishra. I am very much happy that whatever I was arguing for well over five years or so slowly everything is reaching its fruition. But the job is not completed yet we still have to revive the Vedas, Neo-platonism and Neo-platonic Christianity and master it completely by uncovering the great mysteries hidden inside them. Finally after years of research I can cite a paper which fully conforms with my view on Quantum mechanics and why such an interpretation of QM has a huge significance for all those religious oral traditions and traditionalists who emphasize a great deal on revelation. Quantum mysticism is quite often misunderstood by both New Age spiritualists and also by the scientific community, while the former rely on pseudo-scientific and pseudo-religious claims without getting neither science nor religion right on the other hand the latter simply rubbish away any such arguments by saying its all woo woo. While people like Richard Jones have argued that neither quantum mechanics nor mysticism has given the ultimate nature of reality at this current time that doesn't stop optimistic ones like me to correctly lay down each ones domain and explain how both science and religion converge at a single point when both are interpreted correctly differentiating their epistemology and ontology precisely. 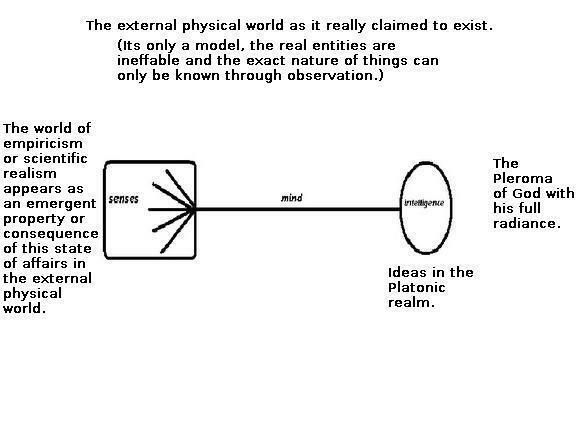 Many non-physical minds exist in the platonic realm. One solution to Wigner's friend problem is to take seriously the dualistic theories of mind and body and argue that quantum mechanics applies to all the universe, our bodies and brain but not to the non-physical mind treating only minds as real having a dynamics of their own. This doesn't mean this view endorses solipsism or absolute idealism but a form of Platonic realism or in the words of Bernard d'Espagnat, a Veiled Reality. Platonic forms are what exists in the noumena and give rise to phenomena, a distinction which Kant affirmed long time back. We have to take seriously the idea that minds are prior to time, space and other Kantian categories as Kant said and give rise to phenomena which is only in a state of inter-subjective agreement between minds. The correct formulation of quantum mechanics which is the quantum information theoretic framework is in complete agreement with this view and it is the only reasonable view possible which otherwise leads to unavoidable paradoxes if one believes that the quantum states have objective existence rather than interpreting it as representing our knowledge of the quantum system. This view is reasonable and highly intellectual and should be considered very seriously as these papers show. Thanks to the John Templeton foundation for recognizing the importance of Bernard's works and its implications to our world. Valentinian Gnostics and Vedic Aryas are those people who broke out from the shackles of their prisoner bodies and turned back and saw the real Sun God who is stimulating everyone's mind and intellect, this empirical world is a mere shadow copy of the real Pleromic world. Scientists, atheists and other believers of orthodox religions are actually inside the cave of King Helios-Aion-Mithras. Who is the first born of all creation? Christ? or the Sun God? I was upset because in the Rig Veda it says it is the Sun God, Hiranyagarbha which is the first-born of all creation. So how can there be two deities at the beginning of creation and each one claiming to be the first-born over all creation? Now any non-believer will say that this is not surprising at all as Saint Paul took a lot of his themes from the pagan mystery religions. To me, that's like undermining Christianity even before addressing the real problem and such a view should not be tolerated and encouraged at all because these morons are ignorant of one aspect of Saint Paul that he had a genuine apostolic Christian tradition behind him named Valentinianism who claimed to have had authentic esoteric interpretation of Pauline Letters and a continuity of genuine apostolic tradition. As Einar Thomassen says Valentinians were the great Paulinists and we will not let anyone criticize our most revered Saint so easily and get away just like that. Isn't it a irony that the person whom the orthodox Church quotes to fight against the Gnostics and the Gnostic ideas is in fact the person whom the Gnostics claim to be their sole initiator into the mysteries of gnosis. Both atheists and orthodox Christians have underestimated Saint Paul and the gnosis of the Valentinian Christians and they are going to pay for it big time. So who is the first born of all creation? Christ? or the Sun God? The reasonable explanation will be that unity appeared as Christ to Christians and at the same time the same unity appeared as Sun God to Vedic Aryans. Well this is a typical pagan attitude isn't it showing tolerance and pluralism towards religions of other nations and their deities. Yes for I am a pagan first and then a Christian. Also I know what its like to have gnostic visionary experiences and it is absolutely arrogant and foolish to assume that only we had genuine experiences and think that the divine revealed itself only to us and not to the people of other nations especially when both of our visions are explaining the same reality word to word having differences only in our linguistic description of the divine. 2nd century Gnostic Christians shouldn't be indebted to Greeks, Neoplatonists, the Persians or the Aryans because the knowledge of the divine is no one's intellectual property and I hope Plotinus and anyone who thinks like that understands it clearly. Any philosopher who expects credit in the matters of the divine and shouts at others for plagiarising his teaching is not a true philosopher and he doesn't really know anything about the divine. If the Vedic rishis had copyrighted all their teachings then every Greek, Egyptian and Persian philosopher and theologian would have nothing to boast about. Nicholas Kazanas runs an institute named Omilos Meleton and here he has published his paper on Advaita and Gnosticism. A study on the possible connection between the ancient Indian philosophical system Advaita (an aspect of Vedanta) and certain ideas that circulated in the first two centuries of the Christian Era in the Easter Mediterranean and particularly in Egypt. Also, an attempt to trace great philosophical ideas e.g. The Unity of Being, The identity of Man's self with the Godhead, etc in Hermetic texts, Vedanta, Christianity, Gnostic writings, Judaism, Greek Thought and Egyptian culture. Published in VVRI Research Bulletin (Hoshiarpur) vol 2 (43-112), 2003. Well disappointingly, even he could not find any reasonable explanation for the startling similarities found between Advaita and Gnosticism. It is this kind of unsolved mystery which compels me to dig deep through the rabbit hole and I am not approaching the problem from a historical perspective but from an esoteric perspective. Sir Roger Penrose influenced me to investigate the pagan mystery religions. This is no mystery, our Vedic rishis who worshipped the pagan Sun God, Savitr very well knew how all the three worlds, the physical, the mental and the objective mathematical world interacted with one another to produce the empirical reality that we see around us. Brain doesn't create the mind actually it is the mind (Manas) which creates the brain. The empirical world of science is not the real physical world instead it is just a state of mind. Intelligence which we call as Buddhi exist in the platonic realm and we access those eternal mathematical truths when the Sun God stimulates the intellect and the mind with his divine rays. The empirical world is just a copy of the real Pleroma of God that exists out there independent of us. The credit of this discovery should go to the Vedic Aryans and it is they who discovered this esoteric secret. This is how we view our universe, this is our model of the universe and we have the power to destroy the secular world and the arrogance of atheistic scientists. This is the truth what you scientists must learn from eastern oriental mysticism. This view challenges the biblical religion, the scientific community and the atheistic community and your so called secular world will be destroyed very soon. All evidence is pointing to a hypercosmic Sun God. What I don't like about orthodox Christians is that how they completely ignore the history of the world and the religions of other pagan nations and assume that anything which is outside from the Bible is from the devil and it is New Age, to me this is the height of foolishness and millions of innocent people are brainwashed to believe just that and orthodox Christians tell me how do you think you are going to evangelize the whole world with the Gospel of Jesus Christ if this is the attitude you show towards pagan nations and religions. I am sorry to say this the world would be a much better place if Mithraism or Valentinian Christianity had won out over orthodox Christianity but the orthodox Church with its psychic mindset and its arrogant bishops persistently persecuted both of them and burnt their teachings. How would Christians feel if we had turned back and did the same thing to them that is bring down every church on the street and raise the statue of Mithras in place of it? However that would be very silly and we are not interested in such things because one doesn't receive redemption by just visiting a church or visiting the cave of Mithras. Its quite obvious that why so many of the scientists are atheists because they would have read the silly beliefs of orthodox religions and would have read their foolish interpretation which is enough to make a man's heart to turn away from God and call him an imaginary being. Its no wonder why orthodox Christianity produces so many of those extreme atheists. What does orthodox Christianity which persecuted every innocent Valentinian Christian on earth gave to the world? Yes it produced atheists like these which it should be very proud of. a petty, unjust, unforgiving control-freak; a vindictive, bloodthirsty ethnic cleanser; a misogynistic, homophobic, racist, infanticidal, genocidal, filicidal, pestilential, megalomaniacal, sadomasochistic, capriciously malevolent bully. This is the reason why I as a Valentinian Christian reject both orthodox Christianity and atheism which is a deep mess which the western world has created upon themselves where the neither party is right about the truth. Its a irony that Valentinus, a 2nd century gnostic Christian is showing the light to scientists, philosophers, orthodox Christians, atheists, pagans and Hindus of the 21st century world. No wonder why he is called truly the gnostic for all seasons whose teachings doesn't make your heart torpid but fills your heart with joy and rest. Valentinian Christianity backed up by Shukla Yajurveda tradition of the Vedic Aryans having scientific support from contemporary physics can bring the secular world down. If this is very disturbing to you then you better know as to where do we stand on the world scene.